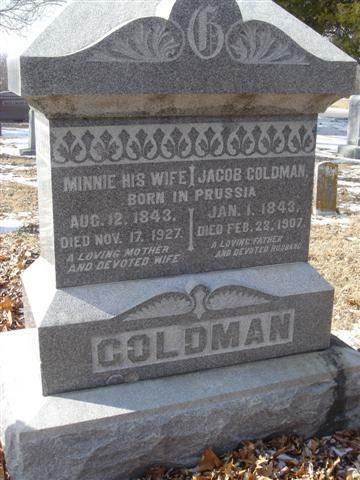 Jacob Goldman, a prominent merchant expired suddenly on February 22, 1907. Mr. Jacob Goldman, one of Jefferson City’s oldest citizens and best know businessmen, died suddenly at the county court house, where he was a plaintiff in a suit against a North Carolina mercantile company. He was born in Prussia in 1843 and came to America when he was 14. He came to Jefferson City in 1863 and lived there for over 40 years. Rabbi Messing from St. Louis conducted the funeral and all of the clothing stores in Jefferson City were closed as a tribute. 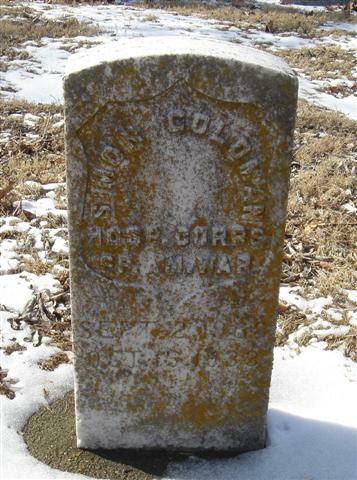 Jacob Goldman is buried at Riverview Cemetery in Jefferson City. Mr. Goldman left a widow (Minnie) and 10 children: Louis(Chicago), Benjamin (Elk City, OK), Samuel, Mendel, Joseph, Solomon, Mrs. SS Boutelje, Mrs. Henry Seligsberg, and Misses Lottie and Dora). In April of 1907 Goldman Shoe and Clothing Company was incorporated under the ownership of Mina Goldman, Mendel Goldman, Paul Kaiser and Joe Goldman. The active management was left to Paul Kaiser and Mendel Goldman. Mendel was born on Jan 25, 1872 in Columbia, MO. He worked in the family clothing store as a young man and later ran the store along with Paul Kaiser after Jacob passed away in 1907. 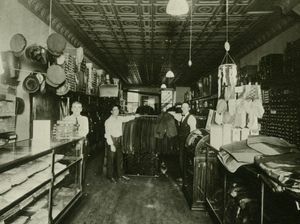 According to the Jefferson City Post Tribune (Jun 19, 1929), The Goldman and Kaiser Clothing Store which was started in 1862, was the oldest business in Jefferson City at that time. Mendel was married to Jennie and they had two daughters Edna and Ruth. Accourding to Mendel’s obituary in the Jefferson City Post Tribune Dec 21, 1929, “Goldman enjoyed the excellent success that honest dealing, plus energy and business ability usually bring. Goldman was a genial personality and numbered his friends by the hundreds. His death is as a matter of regret and a great loss to the community.” Both Mendel and Jennie are buried at Riverview Cemetery in Jefferson City. Joseph Goldman was born in Jefferson City on October 27, 1875. 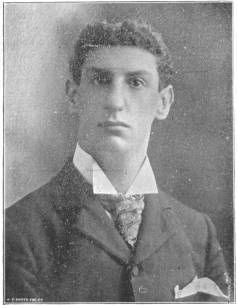 He was educated in the schools of the city and graduated from High School in 1896. He was local editor of the Jefferson City Courier, owned by J.C. Fisher, and worked in that position until the plant was purchased by E.S. Link. During this time he also represented the Jefferson City Tribune for nine months. In response to the call for volunteers for the Spanish War, he enlisted in Co. L. 2nd Missouri Volunteers. The company was located for some time at Albany, Ga., where they were mustered out March 8, 1899, his discharge being March 6. While stationed at Lexington, Ky., he was camp correspondent for the Lexington (Ky.) Leader, and also for the St. Louis Globe-Democrat. Mr. Goldman’s education was acquired with a view to the study of law, in which he was engaged with the Hon. W.S. Pope, but he later gave up the legal profession, yielding to his taste for newspaper work. On returning from the war he was correspondent for the St. Louis Chronicle and the Kansas City Star until July of 1899 when he became assistant editor of the Daily and Weekly State Tribune. He became the proprietor and editor of this publication, employing ten printers and assistants. He also became president and treasurer of the Goldman Shoe and Clothing Company, and owner and manager of the Jefferson Theater. He was a member of the Modern Woodmen of America, and an active worker for the Democratic Party. He lived with his wife Edith and daughter Evelyn at 409 Lafayette Street. 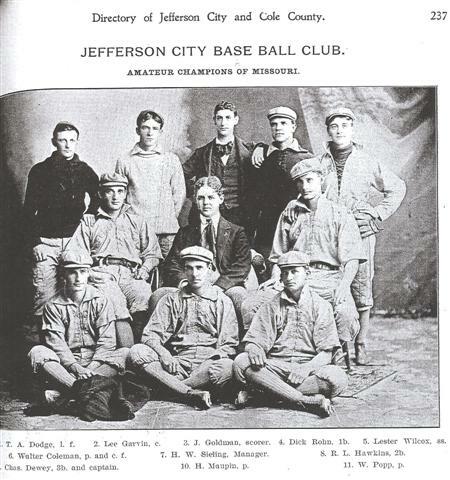 Photo of Joe Goldman, scorer of the Jefferson City Base Ball Club 1900. Sam Goldman, former Jefferson City businessman died in Los Angeles, CA yesterday. Goldman spent some time in the Old Soldiers Home at St. James after retiring from business here and then went to Los Angeles where he made his home with relatives. He was 65 years old. Goldman was born and reared in Jefferson City, September 2, 1868. He was in business with his father the late Jacob Goldman until the latter’s retirement, and then engaged in the business with his brother in the store now owned by Paul Kaiser. He retired when his health failed. In his younger years he conducted a hand laundry in Jefferson City. He is survived by two brothers, Joseph Goldman, now in St. Louis and Ben of California, three sisters, Mrs. Lottie Goldberg, Mrs. Jennie Boutelle, both of Los Angeles, and Mrs. Belle Jacks of Kansas. Goldman served in the hospital corps in the second Missouri Infantry during the Spanish-American War and was a member of the Admiral Sigbee Post No. 26. The Post will have charge of the funeral services, which will be conducted at the Thorpe J. Gordon Funeral home Thursday afternoon at 2:30.